Barely the tip of the iceberg, Randy! Wow! 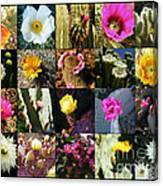 I guess I had no idea that there were so many different shapes and colors of cacti blooms! Just phenomenal collection, Marilyn! Thanks for sharing! This was worth the effort, Marilyn! Thanks, Chrisann! It took me a long time to put the photos together and to get them equal in size! 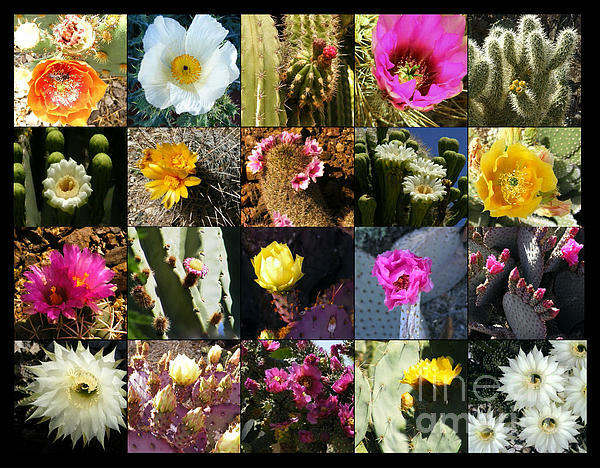 I decided to put together this collage of many of the photographs I have taken over the years of cactus flowers. 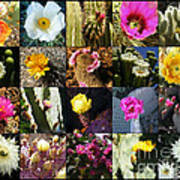 This is just the tip of the iceberg when it comes to the number of cacti varieties there are in the world. This grouping happens to be entirely photographed in Arizona. 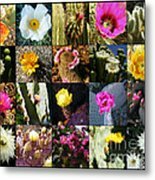 Most of my photos are taken either in my yard, my community or the Desert Botanical Garden in Phoenix, AZ. I do have enough photos like this that I would be able to produce several collages, if I chose to do so.